A closer look at the 400 year old Pont Neuf. In the photo, we can see that the bastions are supported on cutwaters projecting into the Seine. The deck is cantilevered past the arches, and so we can see corbels under the deck. Since they are made of stone, they must be carefully designed to limit the tension at the top of the cantilever. If you look closely, you can see that the bottom of each corbel is supported by the head of a bearded man. Also, you can see how blackened and deteriorated the stone of the bastions have become. I took this photo several years ago, before they repaired this side of the bridge. I must be standing on the Right Bank, looking slightly upstream, and towards the Ile de la Cite. I wonder if they put cutwaters on both sides of the bridge purely for symmetry? 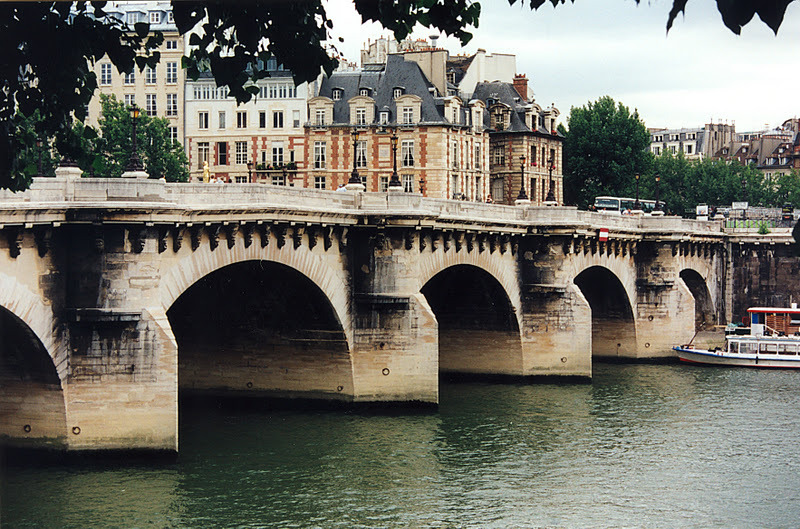 Seine River Bridges: Pont Neuf (2) by Mark Yashinsky is licensed under a Creative Commons Attribution-NonCommercial-ShareAlike 3.0 United States License.